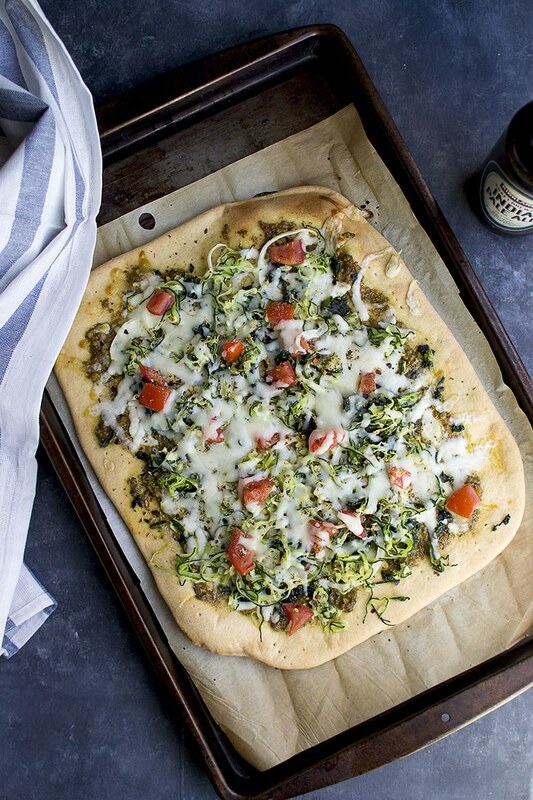 Beer adds a nice flavor and fragrance to this easy to make pizza crust. This beer crust pizza needs only 30 minutes of rising time, so pizza is ready in less than an hour. Combine all the ingredients in a large mixing bowl or the bowl of a stand mixer. Mix and knead until a smooth, soft dough forms. Cover and set aside to rise for 30 minutes or for up to 2 hours. Preheat the oven to 450°F with a baking stone (if you have one) on a lower rack. Divide the dough in half and shape each half into a 10" or 12" round. Place the dough on a parchment paper (if using the baking stone) or on a lightly greased baking sheet. Bake the pizzas right away for thin crust pizza, but for thicker crust, allow the crust to rise for 30~60 minutes. Transfer the pizzas along with the parchment paper to the baking stone. Or place the baking sheet in the oven. Bake for 5 minutes. Remove from the oven and top as desired, and baked for an additional 8~12 minutes, or until the bottom crust is crisp and the cheese is melted and bubbling.